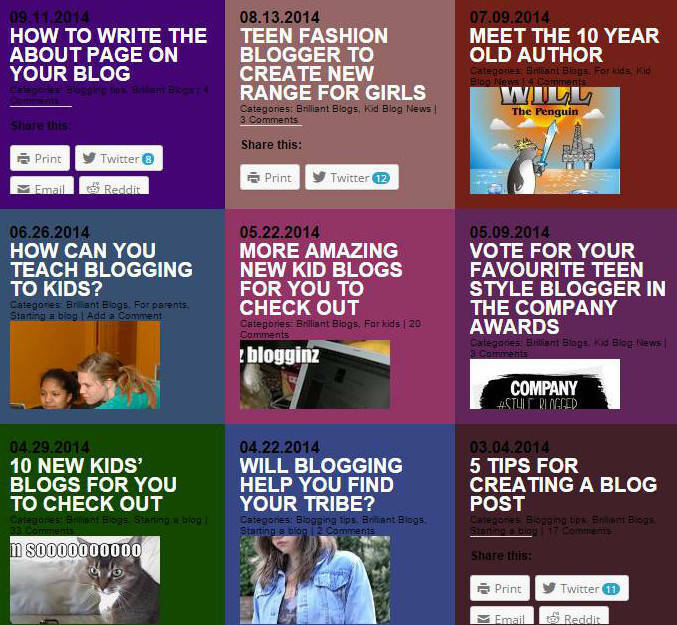 At KidsBlogClub we’re determined to help you make 2015 your best blogging year yet. So to help shine a light on some of the awesome blogs you’ve been creating, we’re going to have a new feature – Kid Blogstar of the Week. Each week we’ll feature one kid blogger, tell you all about their blog and why we think you should go visit it. After that we hope you’ll go say hello to that blogger and maybe leave them a comment or follow their blog. You could make a new friend and pick up some ideas for your own blog too. Tell us what the blog is all about and why you think we should check it out. Please ask your parent or guardian’s permission before you submit your blog and only do so if they say it’s OK.
Feel free to nominate your friend or child if you think we should check their blog out. This feature is open to any bloggers worldwide aged 16 and under. You can stay completely anonymous and you don’t have to tell us your name. We’d love to know where in the world you live, but if you’d rather not say that’s totally fine. Blogs can be running for any length of time – we don’t mind if your blog is brand new and still getting started. It’s probably a good idea to make sure you have at least 6 posts on there so people have something to read when they come and visit. We can’t promise to feature absolutely everybody, but we will aim to feature as many as possible. These sounds like a great new feature. I would love to Blogstar of the Week. I am am 8 year old blogger based in the UK who posts before and after reviews on books, films and plays. Ines has an awesome blog! I personally think that she should be kid blogstar of the week! Hi I would love to be a Kidblogstar of the Week one week! I blog all about my Doctor Who adventures and tell my readers all about the Doctor – with some history, geography and other cool facts too! I’m a 10 year old blogger that posts about what I think and what other people might Love as well ! I know I’m not the best blogger in the world but at least I try. I would love to be formally featured as a KidBlog Star of the week. I have been featured on your Facebook 2 times and in the top 10 new kid bloggers list. Feel free to feature me. I would love to be featured. I blog about whatever I want. I believe that is the key to an awesome blog. I blog to inspire people like other bloggers inspire me. Livy and Ines have great blogs!!!!!!!!!!!!!!!!!!!!!!!! I emailed about being a kid blogstar of the week. Ooh this looks fun! I’ll enter! I’m Noor, a 10 (almost 11) blogger from the U.S. I’m kinda cray cray and I love anything cute and weird. (Yeah I’m like that) I blog about crafts, reviews, advice, my life, and I guess, anything! I am super random and weird. Hope you enjoy my blog! I’m a girl of 16 years of age in Uganda,East Africa.I would very much love my blog to be checked out and be blogstar of the week. I would love to be a kid blog star of the week I have a new recipe blog and I would love to share it with other people! I recently published my first recipe on the blog. It’s an awesome blog so please check it out. Please can I nominate Hayden’s Animal Facts for Kid Blog Star of the Week? Hayden’s blog is fantastic and more people should know about it! He teaches kids facts about really unusual animals and I love to read it.